A. You can click on "Edit Current Design", which will take you to the editor to work on the design you currently have applied to this listing. If this is your choice, when you have finished editing, just click the orange Save & Revise button, and your edited template will be applied to your listing on eBay. B. 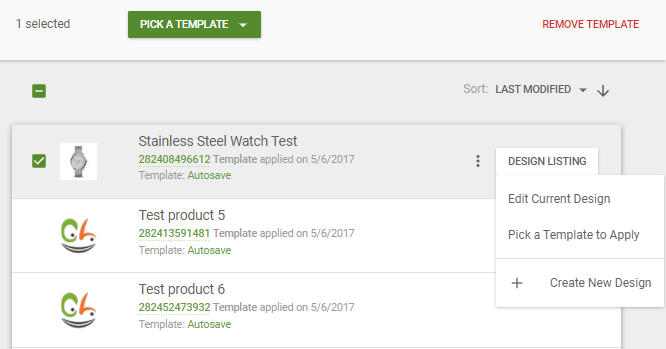 You can click "Pick a Template to Apply" which will then show you a selection of your saved templates to chose from and apply to the selected listing. C. "Create New Design", means just that, start a new template! Same procedure as option A. Once your happy with your template in the editor, click on the orange Save & Revise button. Note: Doing steps A or B will make your listing have a "Custom Design" template, meaning that it will no longer be associated with the template you previously applied to it.